The Goldgasse is a small and narrow lane in the Old Town of Salzburg. It is locally well-known for its antiques shops, galleries and book shops. Tourists like it because of the romantic look of the lane. The Goldgasse runs in a curve from the Alter Markt Square to the Residenzplatz next to the Salzburger Dom. According to the craftsmen and artisans who had their workshops in the Medieval Goldgasse, the lane was sometimes called Schlossergasse (locksmith lane), Milchgasse (milk lane) or Sporergasse (lane of the people who make horseback riding accessories). The current name was given to the Goldgasse after goldsmiths had opened shops there. Today, the entire old town is packed with boutiques that sell luxurious items - the Goldgasse is no exception from this, but it doesn′t necessarily stand out either. It is still an attracive area if you are up for exclusive shopping. The Medieval and Baroque houses of the Goldgasse have five to six floors and are interesting as an ensemble. Few of them deserve individual attention. Note for example the Reitsamerhaus in Goldgasse 5: Its oldest written record dates back to 1425. Later, it became the home of the Frenchman Jean Fontaine, who received the permit to operate a Café in this building in 1700. This café later moved from the Goldgasse around the corner to the Alter Markt, where it is still maintained as "Café Tomaselli" - the oldest Café in all of Austria and the most Viennese, as some people say. In a country that lives off its Café culture, this means quite something. Other burgher houses of the Goldgasse have nice religious ornaments or other decorations on the facades. Note for example the Fragnerhaus or Goldgasse 6, where you can see a statue of the depiction of the Virgin Mary, a copy of the one in Altötting. This is one of the most important Catholic sites of pilgrimage in Central Europe and some 70 kilometres from Salzburg. If you walk through the Goldgasse, note the division of "layers": At the ground level, you have the shops and former workshops. Above those, there are several floors of living space, which are still apartments. Under the roof, you will see that the last floor is a bit lower. These were the least attractive apartments normally used for the staff of the wealthier people that lived on the lower floors. 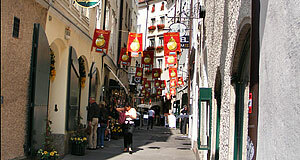 Such a division can be seen in many Medieval lanes in Salzburg. If you compare it to the Steingasse, you will see that the houses there have generally less elaborate houses with lower ceilings - this is where poorer people lived than the craftsmen, artisans and traders of the Goldgasse or even more so the Getreidegasse.